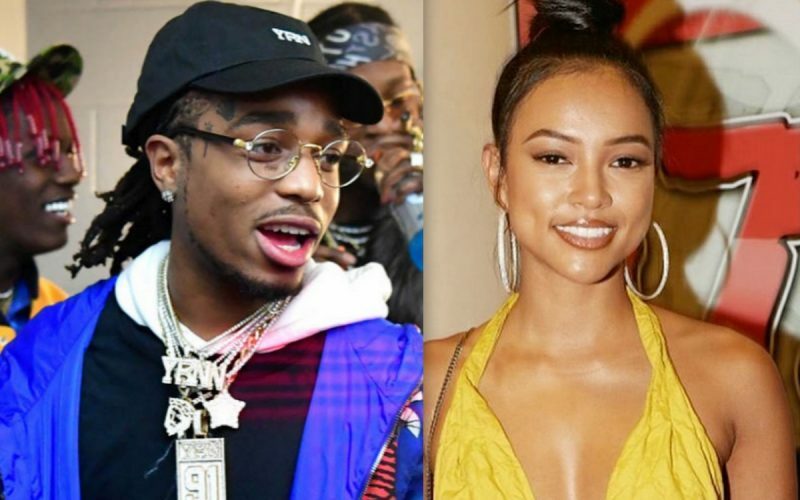 Migos member Quavo is reportedly dating Chris Brown ex-girlfriend Karrueche Tran. Seems Karrueche is feeling bad and boujee following her legal battle with her ex-boyfriend Chris Brown. Since her bitter split with Breezy in 2015, we haven’t seen Karrueche with anyone new. But on Saturday night she was spotted out in Mississippi with Quavo. TMZ posted a clip showing the two partying together at Gulf Coast Spring Fest in Biloxi. Migos was partying at the event and Karrueche Tran was backstage watching her new man performs. The two later left together by themselves in an SUV and headed to an unknown location. There are no confirmation that they are official but this could just be the beginning stages of their relationship. We all know that Chris Brown has a habit of attacking anyone who tried to date his ex-girlfriend and she has been trying for weeks now to serve him with a restraining order that he keeps ducking. A few weeks back, Quavo was rumored to be dating Rick Ross ex-girlfriend Lira Galore after the two were spotted together at a club in North Carolina. Migos has been having a great year with their single “Bad and Boujee” reaching number one on the Billboard Hot 100 chart earlier this year and their new album CULTURE debuting at number one on the Billboard 200 chart. Quavo also recently celebrated his 26th birthday with his close family and friends turning up to support him at a surprise birthday party. Offset gave him a pricey Rolex watch as a gift. Quavo, whose real name is Quavious Marshall, himself has been having an outstanding year outside of the group and almost every big name artists these days want a verse from him. Quavo has in the past collaborated with Chris Brown so it will be interesting to see if Breezy will try to beef with him for dating Karrueche Tran.